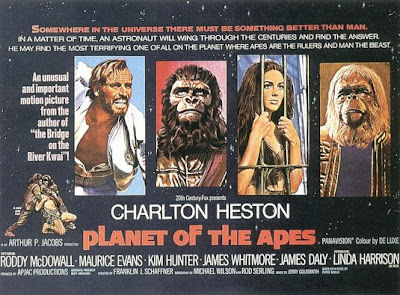 The original Planet of the Apes (1968) has about as much of a legacy in the world of science fiction as 2001: A Space Odyssey (movies which coincidentally came out in the same year and both feature actors dressed as monkeys). With films like this, which you've probably been told were the most revolutionary thing put to celluloid back in its day, it can be hard to believe they'll still be relevant today, let alone possible to watch without snickering. I had similar reservations: this movie is twenty years older than I am, how could it possibly still be good? This is one movie at least which has earned its position as a classic by creating a story which is as compelling and enjoyable as it is timeless. If you're curious enough to consider watching, just go do it. So here's the story of Planet of the Apes. Thanks to faster-than-light travel, the universe has progressed 2000 years into the future but we still get to have a relatable protagonist because he's been on a spaceship in cryosleep or whatever. Due to some malfunctioning space gadgets, Charlton Heston (said protagonist) and two of his redshirt space buddies crash land on a mysterious planet populated by mute humanoids and English-speaking ape-like creatures. Unlike on Earth, here the apes are the ones who rule, and after Charlton Heston loses his voice he must find a way to escape the clutches of this evil race of monkeys. What a magnificent specimen of a man. This movie really just gets everything right. The only thing that might possibly feel dated is the monkey suits, and the only real distracting thing about them is the incredibly minor detail that the mouths don't really open enough to completely match the dialogue. The masks are all varied from each other and contain enough detail to stand up under pretty heavy scrutiny. I don't think they look all that much like monkeys, but they're supposed to be aliens more than monkeys really, and it's 2000 years in the future. At the end of the day, the costumes and makeup worked. The only other thing that didn't stand out as exceptionally high quality was the sound design and soundtrack, and that's only because I was focused on all the other awesome parts of the movie to really pay attention. So let's go down my list of Things That Make A (Good) Movie Good, starting at the top: production design (or what was called back in those days "Art Direction"). I've already declared my general taste for the costumes and make-up, so let's talk about the sets. They're large enough to give you a sense of scale and an idea that this is a unique civilization, but not overly large to the point where they would just become set pieces only in the movie for a "wow look what they built" moment. They have this sand castle quality to them that makes the world feel unique and distinctive. It would have been just as easy to just use exotic location shooting to evoke the sense of another world (which they also did), but in this instance the use of sets added to the unfamiliar and properly alien air of the strange planet. Look at those beautiful cave/castles (sorry about the blurry monkey). Also crucial in a similar way is that the movie is shot wide enough for you to get an idea of both the size and peculiarity of the civilization but not wide enough that you become comfortable or familiar within it. The audience continually finds itself in new locations, unable to completely get their bearings. The cinematographer also uses the classical technique of reserving close-ups for crucial moments of either fear, revelation, or strong emotion (eg. the monkey police are shot in close-up when they chase Heston). Conversations are rarely filmed using shot reverse shot. If you want to know why I occasionally complain about contemporary cinematography you should watch this movie for that alone. This is the kind of thing I wish we would see more often. Then there are the characters. The central plot follows George Taylor (Charlton Heston), the astronaut who crash landed, Zira and Cornelius (Kim Hunter and Rody McDowall), two monkey scientists intent on discovering the truth of their visitor, and Dr. Zaius (Maurice Evans), the head honcho in monkey land who wants nothing more than to cover up the existence of the human Taylor. Before I even get into the details of who these characters are, part of the reason they work so well is that they're stereotyped enough to understand but deep enough to sympathize with. We learn in the first 20 minutes that Taylor has lost a bit of his faith in humanity and that he joined the space program in search of something better. While this helps set up his character and the overarching themes of the story, it's also not dwelt upon or dragged out. In a pleasing gender reversal years ahead of its time, Zira is the determined, confident scientist who must push her weak, soft-spoken fiancé to confront Dr. Zaius with his findings. In fact, the only reason Cornelius is even in the movie is because he discovered something in the desert some time in the past. He doesn't have the strength to stand behind his convictions, and relies completely on the resilience of his counterpart. Zira is the only one who puts anything on the line for Taylor, and is the only one who really represents the desire for knowledge and truth this society (I'll come back to that later). Dr. Zaius is also the perfect antagonist for the story. He represents both the society's faith (as their religious leader) and their law (as their head judge). He represents the classic conflict of the separation of church and state and serves as the perfect foil for Zira. More importantly, he understands the anti-intellectual nature of the society he rules. He knows what Taylor represents, but refuses to accept him into his society and treat him as equal. He is the plague that has brought about this retrograde civilization and the apathy towards truth that it symbolizes. Zaius reveals the horrifying truth of Taylor's situation. So if you've somehow made it this far into the article without watching the movie, I have to warn you that I need to spoil the ending to get to my conclusion. If you're even on the fence about it, just go see this movie. You won't regret it. You know what? Most of the posters for this movie actually spoil the ending right on them, and this movie's existed in pop culture for so long you probably already know what happens. But for those lucky few of you, if you want to turn back now's the time. In the film's grand finale, Taylor discovers the Statue of Liberty buried in the beach and finally realizes that the planet he landed on was Earth all along and that it had drastically regressed in the 2000 years since he left (the apes can speak but lack the majority of human knowledge and technology). From what we see of the planet's current state of affairs and what Taylor tells us in his final despairing monologue, over the past two millennia the inhabitants of Earth became defined by their violence and their resistance to the pursuit of knowledge. Dr. Zaius is undeniably evil, but the reason he is so respected is that more than anything he's a product of his time. And remember before when I was talking about Zira? The reason Zaius is so hostile towards her is that her desire to understand the truth of the universe threatens the stagnation their society has embraced. The ruling powers have no interest in where they came from or where they might be going, their only interest is in self preservation. This fear that the government cares more about maintaining order than about seeking justice is the reason this film is still relevant today. Nothing about this movie is bad and everything about it is good. Go find a way to watch it. Thanks for the link! I'll definitely check that out.